All She Bakes Cakes are bespoke and priced individually for each occasion after a consultation and tasting if necessary but all are within these price brackets. All prices include delivery and set-up charge. She Bakes specialises in chocolate cakes made with a dark Génoise sponge, soaked with champagne syrup and smothered with a Belgium chocolate and fresh cream truffle filling. Dietary requirements including vegan and gluten free can also be met. 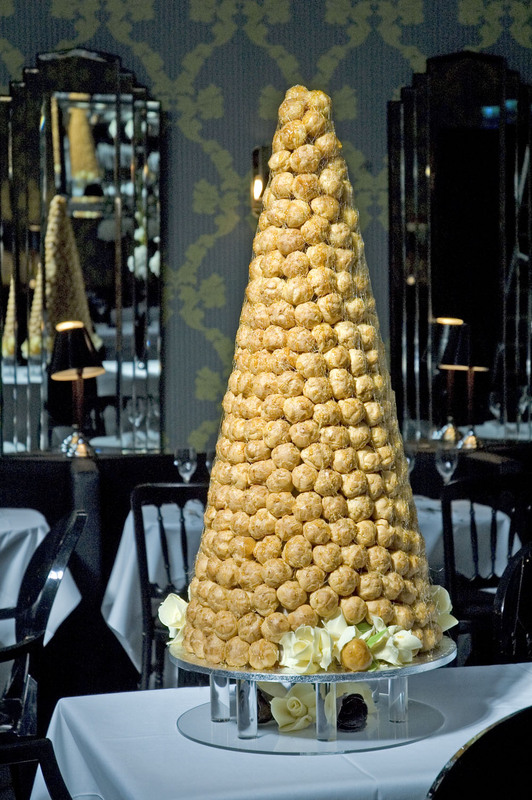 A Croquembouche (or croque en bouche) is a traditional French wedding cake. It is made from profiteroles filled with pastry cream and constructed using golden caramel to stick all the crispy balls of pastry and creamy filling together, resulting in a glorious tower of sweet treats. There are a few things you need to be aware of before choosing a croquembouche for your special cake. 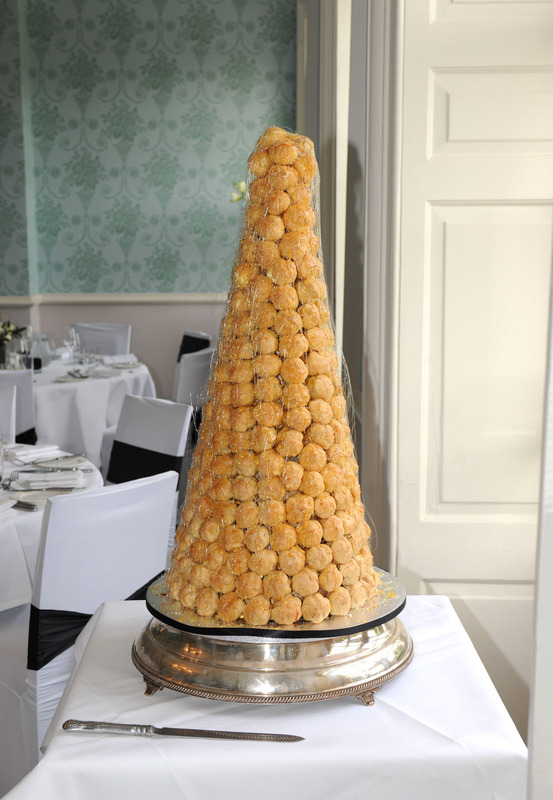 Croquembouche are filled with a mix of pastry cream and fresh cream, the profiteroles are then individually dipped in caramel and stuck together around a cone to produce the wondrous tower of pud! The issue is that I have four hours from the time I finish constructing it to the time you need to start eating it. This is firstly because the sugar starts to melt as it absorbs moisture particles in the air and secondly because it can’t be put in the fridge, there is a food safely issue with the fresh cream inside. Therefore, we need to plan carefully when I will be delivering it and when you’re going to be eating it. Once you have cracked it open and started eating it any left overs can go in the fridge and be eaten later on if everyone’s stuffed or you can save some for your newly wed breakfast!! You will need 2 profiteroles per guest as an evening treat or 4 each as a dessert. Croquembouche can be served with Fresh fruit coulis or chocolate sauce. The Pastry cream filling can be flavoured with vanilla seeds, Amaretto or Chocolate. As shown in this photo you can also choose to have white chocolate roses to compliment the mighty bouche!